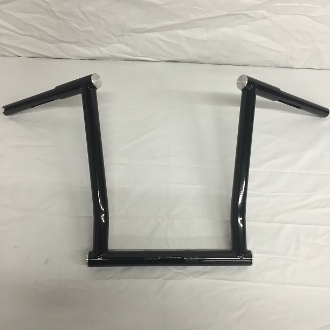 Road 6 Customs "NAKED" handlebars for the 2015-2019 Road Glides! Harley changed the mounting and clamping areas on the 2015 & newer FLTR's and we came to the rescue! Specifically designed for your 2015-2019 Road Glide, these new 1 1/4" diameter bars are available in rises of 9", 11", 13" and 15" with 6 1/2" of pullback for the perfect wrist angle. The 9" and 11" and 13" bars can be installed in under TWO HOURS and required NO ADDITIONAL PARTS! Your stock wiring, clutch and brake lines are long enough. Yes that is correct, the stock brake line, clutch line, and all the wires including the throttle-by-wire is long enough for 13" tall bars. In fact, you do not even have to crack the hydraulic lines so no bleeding of your clutch or brake is necessary! Fast, simple and a breeze to internally wire! The stock cables will not reach for the 15's. Select 9" x 1 1/4" 11" x 1 1/4" 13" x 1 1/4" 15" x 1 1/4"